How to add waketime to your newborns day when your newborn sleeps all day. 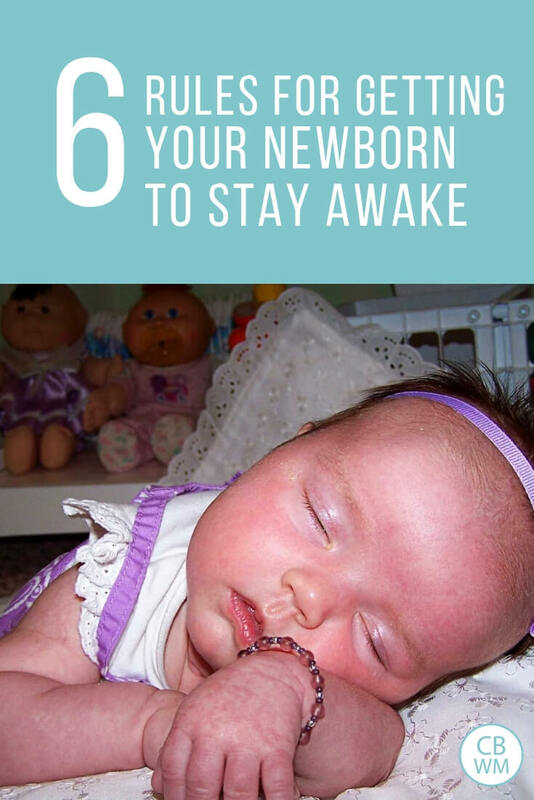 Tips to get your newborn sleeping for naps and all night. I know I have mentioned my waketime strategy for newborns in a post in the past, but it wasn’t the topic of the post. I get enough questions about it that it is obviously not easy to find, so I will outline it here. My strategies in this post really apply to the sleepy newborn. If your newborn is like my son was, he doesn’t want to sleep and you have no trouble keeping him awake unless it is time to nurse. I will link posts on keeping awake while nursing/bottlefeeding at the end of this post. 9:30–eat, treat as dreamfeed. No waketime afterward. 11:00–possible feeding if baby will take it. Again, no waketime following this feeding. If you have another feeding at this time, you might feed at 9 PM instead of 9:30. Here are six rules to follow when your newborn sleeps all day and you want to get some wake time happening. RULE 1: From day one, always work to keep baby awake during feeding times. See Sleepy Newborns and Baby Whisperer: Feeding a Sleepy Newborn for ideas on how to accomplish this. What happens after the feeding is over will depend on where you are in your efforts. Your baby is 0-1 week old. During week one, don’t even worry about it. Let her sleep, and you in turn sleep as much as you can. Even my son was very sleepy this first week. Babywise says during week one to simply focus on establishing nursing (if you bottlefeed establish that). It also says to not even pay attention to the clock, so just take this week to focus on yourself getting all the rest you can. During week two (your baby is between 1-2 weeks old), choose one cycle in the day to start to try to keep her awake. Write down your desired schedule and decide which time of day would be best for you to try to keep her awake. Maybe it is in the evening when Daddy is home. Maybe it is the first waketime of the day. This is the first one I did. I assumed it would be the easiest one since she had been sleeping without any waketime all night long. Think of an activity that is likely to keep her awake. For me, this was a bath (or sponge bath and washing of hair before the umbilical cord fell off) in the morning. Remember, don’t keep her up too long. Start slowly. Take the entire week to get her to stay awake for this one waketime. You aren’t in a race. Take it at her pace. RULE 3: As you are training your baby to stay awake for a waketime, keep in mind that it will take effort on your part. While she is adjusting, you likely can’t leave her to lay somewhere by herself–even at a toy gym. She will fall asleep. Once she is used to staying awake for that period of time, you can change your activities so you aren’t her sole source of entertainment all day, but while she is learning, be wary of leaving her to her own devices. WEEK THREE:During week three (your baby is between 2-3 weeks old), choose another cycle in the day to add some waketime to. You will now have two waketimes in the day. Again, don’t keep her up too long and work up to it throughout the week. The second waketime I added was after her 4 PM feeding. My husband gets home close to the time she was done eating, and Brayden usually wasn’t up yet, so it was some good time for him and her to spend together. RULE 4: As you add more waketimes to the day, try to stagger them. For example, don’t start with the first two waketimes of the day. Do a waketime, then just let her sleep, then a waketime, let her sleep, etc. You can stagger them ore than that if you want to (one in the morning and one in the evening). She will be more successful at staying awake if she is better rested. Your baby is between 3-4 weeks old. As in other weeks, add one waketime to your day, so you are now up to three. At this point, some babies might be able to add two. Many start to be more awake at this age, but some (including my daughter) are still very sleepy. This was the age my son started to reject the idea of sleeping in the day (remember we didn’t start BW until he was 9 weeks old). The third waketime I added was after the 10:30 AM feeding. We occasionally ran errands and/or had visitors after this feeding, so it was a convenient time to have her awake for a bit. RULE 5: Growth spurts can really throw things off. 4 weeks is a typical growth spurt age, so be on the lookout for it. Your baby won’t nap as long, so waketimes will likely need to be shorter. Watch for the nap cues (see Nap Cues and Sleep Cues from the Baby Whisperer). Also, once the eating portion of the growth spurt is over, the sleeping portion begins. Your baby will be more tired. WEEK FIVE:Your baby is between 4-5 weeks old. The babies who did not become more alert in week four often do in week five. Again, you add a waketime to your day, but if your baby is more alert, you might be able to add two. You will be up to four if you are doing one per day, and five if you have done more than one during a week. Kaitlyn was sleepy, so we just dropped one. We added the waketime following her 6:30 PM feeding. This was a time for the family to be together and also get ready for bed. RULE 6: If you find your baby is really sleepy, you can prolong the addition of another feeding if needed. Perhaps you will take two weeks to add one waketime to the day. Maybe a week and a half. If your baby is very alert, you can add more than one waketime to the day, just be cautious to not add too may at one time. These strategies are not set in stone. Adapt them as useful to your family. WEEK SIX:Your baby is between 5-6 weeks old. You can again add a waketime to the day if you are still working on it. This should complete your waketimes. Your baby’s optimal waketime lengths might be extending also, so be mindful of that. Also, 6 weeks is another growth spurt time. The last waketime I added was after her 1:00 PM feeding. One reason for this is that for the first four weeks, I napped at this time since Brayden was napping. Another is that it was her hardest time of day to stay awake. You should now be done! If not, continue adding waketimes as needed. Again, your baby might need to start slowly, but can add them quickly as she gets older. She might need to take things more slowly. Take things at her pace. Each baby is different. Don’t feel stressed out to add all waketimes all at once. It will all come with time. OH my gosh! Now I feel normal because sometimes my 4 1/2 month just can’t do a “wake time” every single time! Thanks for the post! Rhianna, I think the faster you can get to full waketimes in the day (full for the baby), the more likely STTN will happen earlier just because there is enough waketime in the day, but you really have to take it at your child’s pace or she will end up too tired to sleep well at night anyway. You are welcome Atara! Some are just sleepier than others. Amy, I am supposed to, but I haven’t since the beginning of September. I don’t know what the problem is. I try to find the questions, but as you might imagine is is pretty hard. Kind of like finding lots of needles in a large haystack. I will see if I can find it. Natalie, You are most welcome! lol, hopefully I am famous and not infamous 😉 See this post for ideas on that 5 am waking:Early Morning Feedings Before Waketime: http://babywisemom.blogspot.com/2008/01/early-morning-feedings-before-waketime.htmlIf she isn’t eating well at 10:30, I would definitely expect her to wake at 5:00/5:30 and be normal.Yes…my daughter could only do an hour even around 4 months. I think it wasn’t until 5 months, maybe 6, that she started to extend it a bit. See the sample schedules to see for sure, but she was a 1 hour girl for a long time. At 2 months, I think one hour sounds 100% normal. plowmanators-She does eat really well at 10:30 but I don’t know what’s going on because last night she woke up at 4 am and just wouldn’t go back to sleep. Today was a bad day for naps and I’m pretty sure tonight isn’t going to go so well. I’m trying my best but I really don’t think she’s hungry at 4 am. Going in to soothe her doesn’t help, plus I want her to learn to sleep without me having to go back in there. My newborn (now 1 month old) NEVER sleeps. I have no trouble with wake times. It is very seldom that he will go to sleep after I nurse him. Usually, he is content for about 20 minutes after I nurse him and then cries until time to nurse him again (which he always seems hungry before the 2.5 hour minimum). If ever he does sleep, it is because he goes to sleep immediately after nursing (usually at night) or because I walk, rock, bounce…him to sleep (and even this doesn’t always work). Any advice on adding SLEEP times to my Newborns day???? I am at my wits end. Natalie, a couple of things. One, BW says 9-10 hours of sleep, so even though your doc said she can go 10 hours…at that age I would at best hope for 7-8, moving toward 9-10.Another thing to do is be sure she is getting enough waketime in the day. If she isn’t awake long enough in the day she is likely to try to get it in the night.Another thing is to be super consistent with morning waketime–to the minute. You can also try CIO at night if you are sure she doesn’t need anything else. Thank you Thank you Thank you!My daughter is only 5 days old and I am not paying too much attention to the clock or waketimes, but she sleeps ALL the time, no waketimes even when I’ve tried. So, finding your blog was extremely helpful. My other daughter is a BW baby and I know I will be returning again and again to your blog for tips and advice. Thanks! It is so exciting to find your blog! I love babywise but sometimes wonder things and it’s nice to ask someone who really thinks through the process. I just had my 3rd child. I breastfed my first and did a 3 hour schedule and bottlefed my second and did a 4 hour schedule. My question is that I’m breastfeeding this one and I’m doing a 3 hour schedule. I noticed when I looked at your schedule you did an optional 7th feeding which makes 6 and then you put them down for the night. That is what I’ve been doing with my little guy because he has reflux and he was sleeping worse at night with the 7th feeding because he spits up after every feeding. he is waking once a night at 3:45ish. Do you think by only doing 6 feedings that this will delay sleeping through the night? Thanks! Hi There! I just found this blog and it has been so helpful…thank you so much! I have a 5 week old son and we are just starting to implement babywise. My LO seems to be pretty awake during the day. How many naps should a 5 week old be taking during the day? Is it normal to go without sleeping between two feeding sessions? We are just beginning CIO today so that might help with his napping. He has been sleeping very well at night. Thanks for your help! Hello! I’ve been trying to use BW with my son since day 1. He’s 3.5 weeks old now. My question is…if he eats at 7a,10a,1p,4p,7p and 10p (dreamfeed)…and he goes down for a nap at 5p, then we feed him at 7p and put him right back down- should I be having waketime after the 7p feeding? This is the most confusing part for me. Putting him right back down after the 7p feeding means he will have been asleep since 5p…is this how BW lays out the schedule? In the book, the sample schedule says “possible waketime” after the early/mid evening feeding- so I haven’t been sure whether to keep him awake some after the 7p feeding or not? We’ve been putting him down, but I’m worried that this might be why he’s so alert after the 2a feeding! Oh I am so glad I have found this blog!! We are doing babywise but I still have questions. Our bubba is 2 weeks old tomorrow, he is a very sleepy baby – we wake him for most of his feeds (6am, 9.30am,1pm, 4.30pm, 8pm, 11.30pm – then usually 2 – 3am). We work hard to keep him up for 45min – an hour – and often when we put him in his cot he is straight to sleep during the day – and needs no settling. During the night however he often wakes us for his feed before the scheduled time and then is very difficult to settle back to sleep – I have tried using a dummy and after 20min of settled time he starts crying again. Any ideas on how to settle him or why he does struggle to resettle at night? My thoughts are: *Too much awake time during the day so he is over stimulated? We have been keeping him awake even though we know he is tired and demonstrating sleep cues as we are worried if he sleeps too much during the day he wont sleep at night (like when he was first born). *Because he is so tired during the day, he does not have practice with settling himself to sleep so at night is not sure how to? * He is hungry? Although we have increased his feed to 120mls and he feeds every 3.5hrs during the day and about 2.5 – 3hrs at night. Any advice people can offer would be great – we loves the routine and we would like to figure out this night thing!! Sharyn, my advice would be to just hang in there! By "dummy", do you mean a pacifier? If so, check out this post: http://babywisemom.blogspot.com/2008/04/pacifiers.htmlYou may want to consider feeding him every three hours during the day, instead of every 3.5 hours. Getting more feedings in during the day may mean less feedings during the night. BW says baby should be sleeping 9-10 hours at night before moving to a 3.5 hour schedule.As I'm sure you've read in Valerie's "Newborn Summaries" (see blog label "Newborn summary"), her DD has been needing less than 60 minutes of wake time most of her life (10 weeks now). Check out the blog label "optimal wake time" if you have any more questions than that.If nothing else, it sounds like you're doing a lot of things right. Your baby is still young and still figuring things out. Continuing to be consistent with feedings, etc will help him figure out he needs to sleep longer at night. It will come! Good luck! Hello! I have a 4 week old, he is my first so we are learning lots! Well he is a very awake baby during the day. I read that a baby his age should not go without sleep inbetween feeding times…he has done this several times, atleast once a day. It makes it very difficult to stick to the schedule I want him on. What is interesting is that he sleeps great at night, he has consistently waken up to feed bwtn 1-2am and then again bwtn 4-5am and then starts with his 7:30am feeding. He goes back to bed pretty easily afterwards too. Except for the past two nights where he has woken up 1 hr to 1 1/2 hr earlier than usual to eat and has been difficult to go back to sleep after his second feeding. This is what made me start questioning his waketimes and naptimes during the day the culprit. I just read through several blogs for tips and plan on trying them out starting today to get his wake times shorter and have more consistent naptimes. But I wanted to ask this..I can tell when he is tired, I have become better at reading him but he is difficult to get to sleep. I try several things before finally just putting him on my chest, tummy down and he always falls asleep! I can then transfer him to his crib where he will HOPEFULLY sleep until his next feeding, but is this considered a sleep prop? Its so hard to take something away if it works ya know but i've tried the swing and he doesn't much care for it. Thank you!! Eltza,That is pretty normal for a 3 week old. He should be getting 8-10 feedings per 24 hours and he is getting 9, so that is right in line with normal.With the young newborns, you can try to have waketime, but if they won't do it, don't stress about it. You can add waketime to the day gradually. Also, keep waketime short. Feeding counts as "waketime" also. Danielle, that is a sleep prop. One thing to keep in mind with it is that at some point, he will not sleep well that way any more. Also, he isn't learning to fall asleep on his own. However, he is still young. If you do it knowing that at some point he is going to have to learn a different way of sleeping, then you will know what you are in for in the future. I find it much easier to start how I want it to be from a young age (start as you mean to go on).Check out the blog label "CIO" for tips on that route. There is also the 4 S's by the Baby Whisperer–you can find that through the Baby Whisperer blog label. Aunt Kristen, until Valerie can respond to your comment, make sure you check out the Cry It Out section of the blog index, if you haven't already. There are lots of great blog posts there that can help, especially the Revised CIO Bootcamp (http://babywisemom.blogspot.com/2009/12/cio-bootcamp-revised-and-updated.html). You may want to also try the Baby Whisperer's 4 S's to help your baby learn to fall asleep on their own. I did that with my second daughter and felt there was a lot less crying than when we did sleep training with my first daughter. See Valerie's post about it here: http://babywisemom.blogspot.com/2009/04/sleep-training-four-ss.htmlDon't be afraid to cut down his wake time and put him down when he seems so awake… I know with my 4 month old daughter, even now I sometimes think, "But she's so happy…" when it is time for her to go down. BUT she goes to sleep without a peep when I stick with the amount of wake time I know is right for her.I hope that helps! Good luck! Erin,1-most babies will be awake 2 hours on a 4 hour schedule, but for a baby that young, that is unlikely. 2-yes. You should wake her when it is time to eat. It is fine if she wakes on her own to eat.The reason her waketime length doesn't add up to your schedule is because she is on a 4 hour schedule before she is old enough for it. If that is what you want to do, you can, but you defintely can't expect things to add up nicely. Babies that age typically can't handle being awake longer than1 hour, so she is being normal for her age.It is fine to wait up to 30 minutse to feed her. See "eat/wake/sleep cycle" for more on that. Aunt Kristen,I think Jennifer had sound advice for you (thanks!). Check out those posts she mentioned and let me know if you have further problems. My daughter is 2 weeks old so we're working on the schedule now. She eats every 2.5 hrs during the day: 7AM, 9:30, 12:00, 2:30, 5:00, 7:30, 9:30 (then 2x during the night)I have a couple of questions1. Does this mean that she's supposed to take a nap in between every single feeding? In the morning I have no trouble with the eat/wake/sleep. But late afternoon on once she's awake she will not fall asleep and is awake until her next feeding. Even if I try to make her sleep with rocking, bouncing and so on. 2. What do you do then? 3. Should she go straight to sleep w/o any wake time after the 7:30 or 9:30PM feeding?4. I know nursing counts as wake time but she takes 30 minutes to eat and it really seems like she's nursing in her sleep. If a 2 weeks old wake time is around 45 minutes do I really only try to keep her up for 15 minutes after nursing?Sorry for all the questions, I'm just confused. Thank you in advance! Emily, just a few thoughts for you until Valerie can get to your comment. At this age, there should be a nap between each feeding. Hopefully, Valerie will have some suggestions for you on how to make that happen. And yes, 45-50 minutes of wake time is plenty. For me, pretty much the whole wake time is feeding/diapering at that age and that's ok. The 9:30 feeding is a dreamfeed–see the blog label "dreamfeed" for more info. Good luck! Emily,1-yes she should be sleeping between feedings. However, some don't due to witching hour (see witching hour blog label). 2-see the post "waking early from naps/won't fall asleep for naps"–but do also see "witching hour" blog label3-she might have playtime after eating at 7:30, but she also might need to go straight down. After the 9:30, she should go straight down.4-yes, only 45 minutes. By now at 4 weeks, she most likely can still only do about 45 minutes at a time, including nursing. Some might be able to do as much as 60, but most only about 45. Hi Val,Just curious if the ages you give are the actual age or the adjusted age if born early. Since my twins were born two weeks early, they are super sleepy newborns. I was going to wait until they were at the adjusted age of 1 week or 2 weeks old (3-4 weeks actual age) to add wake time. Susanne, the ages I list are actual ages.Kaitlyn was three weeks early.McKenna was three weeks and one day early.I don't think you can fully adjust for age week for week. It isn't accurate unless the doctor was 100% spot on for your due date, which is super rare. Every cycle is different and date of actual conception can range.So with the girls, I knew they were about a few weeks early, but their actual age is their actual age. I would have patiencee for things like STTN and remember they came early.I think two weeks shouldn't have a huge impact on things. My little lady turned 6 wks yesterday and we just started BW this past weekend (wish I had known before), 6 days ago. Your post on optimal waketimes for her age say 40-60min. I have been meticulously taking notes and 30-35 min is all she can handle fter each feeding, except the 10am feeding-which is 45min. I'm thinking maybe this is becuase we started training later…AND what am I supposed to do with her for 60 min? When you say, just add 5 min at a time, is that like if she is cranky keep playing with her /trying to keep her awake or…how do you add the time? I know this is tricky becuase I didn't add just one waketime at a time. I didn't add them all at once, that is just what she has done since we started.She naps well and if I get her fed, played and down in time (no overstim) she goes down very well and tipically doesn't cry more than 5 min after.Thank you so much for all your work on this blog…it has been tremendously helpful since we got on board a bit late. Sarah, always go with what is optimal for her as an individual.When I say to add five minutes at a time, that is only if you think she is ready for it. I suggest adding a very short amount of time because to a young baby, five minutes is a really long time. If you go too long, you will overstimulate her.Good luck! We have a six week old who we are having a problem keeping awake for wake time. He falls asleep at the end of the bottle and it's so hard to get him up. Any suggestions? I have a 6 week old who simply refuses to stay awake after feeds. I'm not so much worried about getting him to wake as he is starting to stay awake more during a feed and so it is improving. My concern comes in that he won't learn to disassociate feeding and sleeping. When should I start to worry about this? At what age is this a problem if they haven't stoped falling asleep at the tail end of a feed?